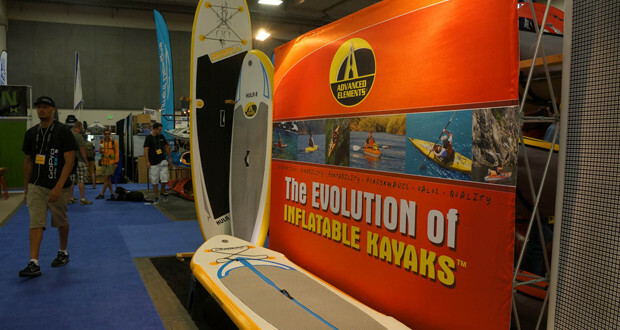 Advanced Elements has spearheaded the evolution of inflatable SUP boards. These inflatable stand up paddleboards have distinctive features and uses. 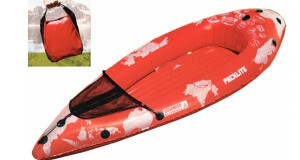 But also feature the portability and durability of the inflatable kayaks that are so popular. You will not be disappointed with the Advanced Elements inflatable SUP boards line. All of their SUP boards deflate and fold in to a duffle bag ranging in size from a small carry on to a large suitcase. They also include a single-action pump with gauge, repair kit, 3 removable tracking fins and a valve adapter. The ability to pack your stand up paddle board in your car is amazing but to be able to unfold, inflate and hit the water in minutes is mind blowing. A great line of SUP boards for families is the Hula 11 and Hula 8 from Advanced Elements. They are made of high-pressure drop-stitch material and a double layer of heavy duty PVC tarpaulin that provides ultra stiff performance and the best durability. 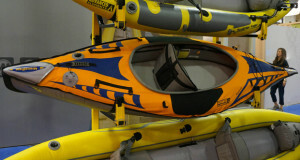 Both boards have a large foam traction pad; with the Hula 11 also featuring D-Rings for gear tie down, optional kayak seat attachment or leash attachment. Both SUP boards are white and orange and are lightweight with the Hula 11 coming in at 23 lbs and the Hula 8 at 16.5 lbs. The Hula 11 is a little larger with a length of 11’ and a thickness of 4”. The Hula 8 is a little more compact at 8’ and thickness of 6”. The Hula series of inflatable SUP boards are perfect for kids and families and ideal for paddling, surfing or kayaking. The newest SUP Board from Advanced Elements, the Stiffy has a revolutionary design that rivals the rigidity and performance of hard board SUP’s. This board is so unique in that it incorporates aluminum support shafts along the sides of the board, giving extreme rigidity. Especially for a SUP board that can pack down and be transported anywhere easily. The board is also made out of high-pressure drop stitch material, which allows for its stiff performance. 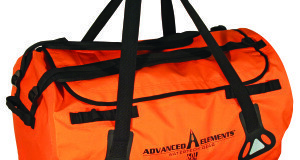 It comes with 5 stainless steel D-Rings for gear storage, a kayak seat or leash attachment. The white and orange Stiffy has a max weight of 230 lbs and weighs just 32 lbs. It is 11’ in length and has a thickness of 4”. The new Stiffy SUP truly is the evolution of inflatable stand up paddleboards!